Look for an ORIX Rent a Car site near popular tourist spots. 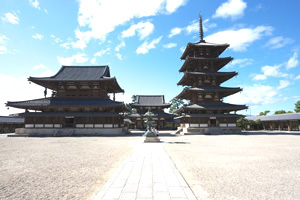 Said to have the world's oldest wood buildings, built in 607, Horyu-ji is known for its five-story pagoda (31.5 m high). These masterpieces of wood architecture have great significance in Japanese art and Buddhism in Japan. Among the many valued cultural assets are national treasures and 48 Buddhist sculptures. 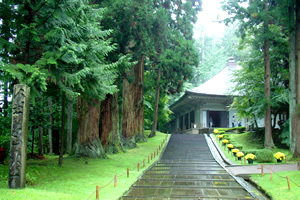 The temple is one of most stimulating and pleasant sites in Nara. If you like castles, then Himeji Castle is a must-see: sophisticated appearance in a subtle unity of distinct building masses and roofs. Built in the Edo period (1603-1868), it's one of Japan's most famous castles and a fine exemplar of 17th-century Japanese castle architecture. 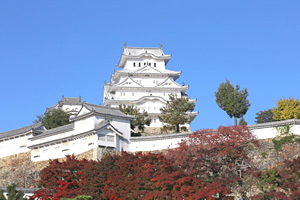 Another name for Himeji-jo, White Heron Castle, comes from its resemblance to the elegant look of the eponymous waterbird spreading its wings in flight. An island where beautiful nature endures with rich plant life and ancient forestland. Jomon cedar, largest tree on the island, is particularly famous, estimated between 6,000 and 7,200 years old. Nagatahama, the northern beach, is one of the world's leading spawning areas for green turtles. 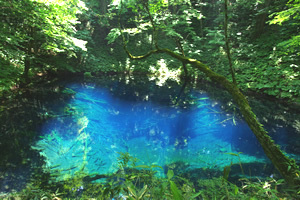 In this vast mountain area from northwest Akita to southwest Aomori prefectures are untouched forests of virgin beeches. Here also diverse flora and such fauna as black bears and 87 bird species grow wild, and valuable ecosystems are carefully conserved. It's no wonder that Kyoto is the world's favorite tourist destination: dotted with many temples and shrines inscribed as World Heritage sites, national treasures, and more. Japanese culture and traditions can be fully appreciated just by strolling around the ancient capital, among historic gardens and sacred architecture. Traditional architecture known as the Gassho style informs the steeply pitched thatch roofs built for heavy snowfall. 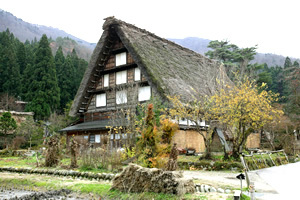 Such house structure is unique in Japan and may be found only in these two villages, Shirakawa-go and Gokayama. On August 6, 1945, at 8:15 a.m., an American B-29 bomber dropped the word's first atomic bomb over Hiroshima, at a height of 580 meters, southeast of what would become the memorial Genbaku Dome. Its exterior wall survived because the building received the shock wave from above, a blast that wiped out 90 percent of the city. 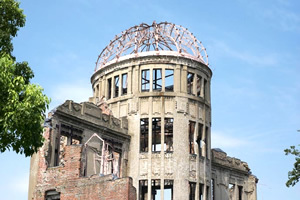 Today, Genabaku Dome is a living testament to humanity's destruction and the need for peace as well as elimination of nuclear arsenals. 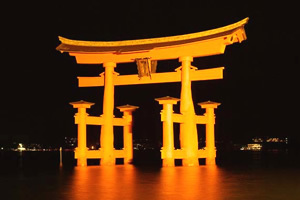 Itsukushima Shrine, World Heritage site dating back to the sixty century, is a vermillion-lacquered shrine housing a great torii gate (16 m) of camphor and cedar, several National Treasure structures, and the only Noh stage in Japan to rest upon the sea. The ebb and flow of the tides transforms seascape and landscape as well as the shrine itself into a breathtaking vision. 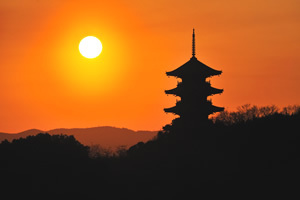 Nara was Japan's capital throughout the eighth century (710-784), a period of sweeping political change-to emerge as a fountainhead of culture and historic art and architecture, including tumuli and Imperial Palace ruins. 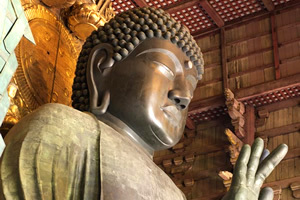 Among monumental works that survive to this day are Todai-ji's Great Buddha sculpture (14.7 m) and Kofuku-ji's towering five-story pagoda, two of the eight Historic Monuments. 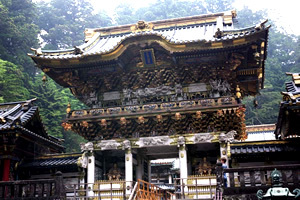 The varied sacred shrines and temples of Nikko, compelling for over-the-top bold decor and fiery color schemes, make up the World Heritage site closest to Tokyo. Set against the palette of autumn leaves, the site becomes a brilliant seasonal canvas. Toshogu Shrine, exemplary for lively architecture, is dedicated to Ieyasu Tokugawa, one of many outstanding Nikko buildings closely associated with Tokugawa Shogun history. Inhabiting these sites and properties is the living history of five centuries of singular Ryukyuan culture, architecture, and sacred ritual. 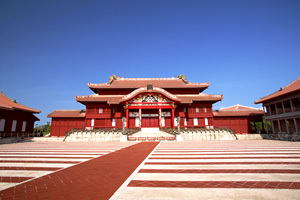 As the Ryukyu Kingdom's premier citadel, Shuri Castle played a dominant role in the area's prosperity, politics, and cultural growth. Ancient sites in southern Okinawa Island bear the legacy of a traditional form of nature and ancestor worship. One of the most dramatic landscapes in Japan, the Kii Mountain Range embraces mountains, rivers, and forests deemed worthy of extended pilgrimages, from Kyoto to Kumano, by royals and ruffians for over 1,200 years. 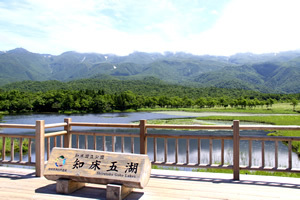 The four sacred mountain sites are Yoshino, Mt. Koya, Mt. Omine, and Kumano, on a route viewed by Buddhists as bookended by the Diamond and Womb Mandalas. 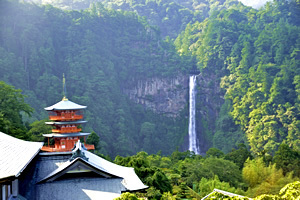 Each site is a unique expression of syncretism between animist Shinto and meditative Buddhism, set among thrilling trail systems winding through nature in its most lush and compelling aspects. This peninsula on the northeast tip of Hokkaido and facing the Sea of Okhotsk is one of Japan's finest, where marine and terrestrial ecosystems interact dynamically. So dynamically, in fact, that flora and fauna species including threatened ones, like Blackiston's fish owl and Viola kitamiana, depend on this landscape of untouched nature. Winter sees ice floes, and the sea is a habitat for marine life like whales, sea lions, and salmon. Shiretoko Mountains traverse the peninsula, home to deer, native brown bear, and white-tailed sea eagles. Iwami Ginzan was discovered in 1309 and became world famous around the 17th century as the mine with an output of 30% of the planet's silver. 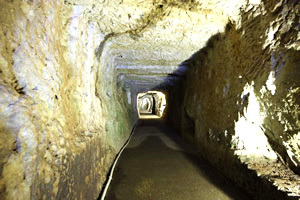 The mine and its environs also features routes used to transport silver ore to the coast and to port towns from where it was shipped to Korea and China, an industry that contributed substantially to the overall economic development of Japan and Southeast Asia. In the latter part of Heian Period (794-1185), Oshu Fujiwara Clan prospered in Hiraizumi and established many temples based on Pure Land Buddhism, which offers a cosmology incorporating a vision of paradise that contributed significantly to garden design in Japan. Chuson-ji's Konjikido (Golden Hall) maintains its original form, dazzling eyes with golden interior decorations. The solitary beauty of Mt. Fuji against the horizon has been inspiring pilgrims and artists throughout Japan's history, from 18th-century woodblock print artists to 21st-century pilgrims in heels and designer jeans. In the 12th century, the sacred peak (3,776 m) was the center of ascetic Buddhism. 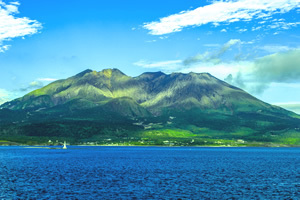 This majestic stratovolcano, recently named a World Heritage site, is the iconic image of Japan to the world. 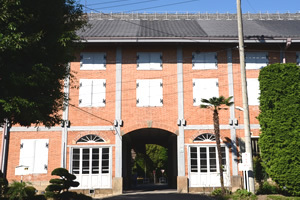 In a place few would expect tradition and technology to seamlessly weave together, Gunma Prefecture's Tomioka Silk Mill comprises four areas of distinct skill and tool sets, from innovative cold storage of silkworm eggs and French silk-reeling facility to genetically modified cocoons. 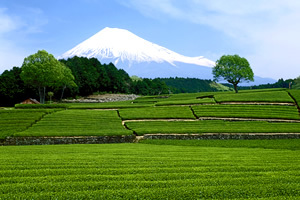 The mill and surrounding area therefore launched forth as the heart of Japanese sericulture and today continues to put Japan among the world's top exporters of raw silk, notably to Europe and the U.S.A.